The Senakin coal mine comprises bituminous coal in a deposit which runs for approximately 40 kilometers long. In November 2001 Bumi Resources acquired 80% of PT Arutmin Indonesia (Arutmin) from BHP Minerals Exploration Inc. At the time of acquisition, Arutmin was the fourth largest coal producer in Indonesia. In April 2004, Bumi Resources brought its shareholding in Arutmin up to 99.99% and the following year undertook a minor divestment of its shareholding in KPC. In 2007 Bumi Resources sold a 30% share of the company to Tata Power of India. 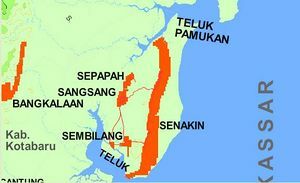 The mine, which is owned by Arutmin, a subsidiary of Bumi Resources, comprises the Sangsang, Sepapah and the East Senakin deposits. This page was last edited on 3 October 2012, at 20:33.